Americans are swallowing antidepressants like Zoloft and Paxil at four times the rate they used to, according to the latest statistical report on the nation's health, released this week by the Centers for Disease Control and Prevention. 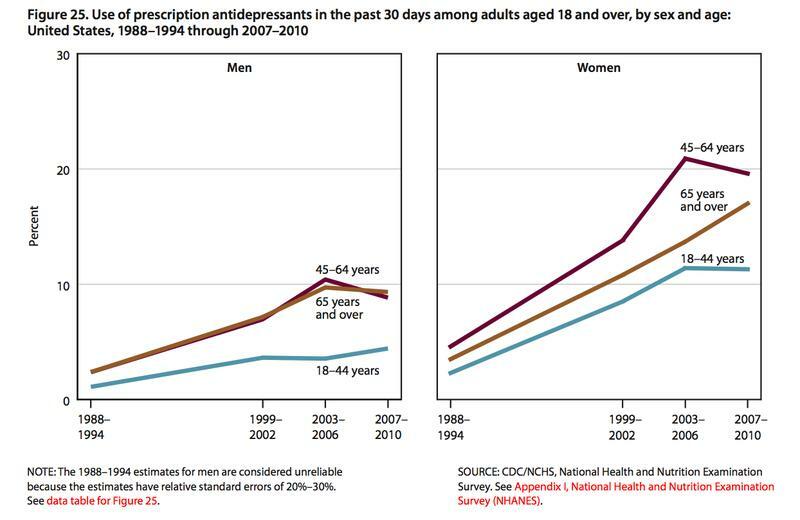 These facts on antidepressants come from the special feature in this year's report on prescription drug usage, rates of which have increased in general for Americans over the past half century. Why are so many people taking antidepressants? The skyrocketing rate of "happy pill" consumption may not mean that people are more depressed than ever. At any given time, 9.1% of adults fit the criteria for being depressed, the CDC estimates. And people also take antidepressants for other reasons, including panic disorders, anxiety, and menopausal symptoms. Other potential causes for the increase include reduced stigma around seeking care for mental illness, usage of these drugs to treat other mental disorders, and marketing efforts by pharmaceutical companies. Some recent research indicates that antidepressants may be overprescribed. A survey last year, for example, found that two-thirds of a group of 5,000 that had been diagnosed with depression did not meet the conditions for a major depressive episode. And some patients may be correctly diagnosed as depressed and opt for non-pharmaceutical treatment — cognitive behavioral therapy, for example. Still, the National Institute of Mental Health says that the drugs may be both over- and under-used: they cite research that says that only half of people with major depression receive care.